This is an unread limited edition (number as shown) copy, pristine condition, signed by the artist (Michael Whelan) to the limitation page. Issued in a truly stunning foil-stamped leather slipcase. This volume contains that expanded version of "The Gunslinger" as well as the novella "The Little Sisters of Eluria" which chronicles an earlier adventure of Roland¿s as he pursued the Man in Black. 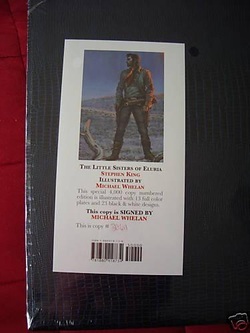 Published in a larger format than the Dark Tower series which enhances Michael Whelan¿s thirteen full color plates and over twenty three black & white designs. A number of the books have been hand-illustrated by the artist Michael Whelan, and this increases the value of the book significantly (the previous Gunslinger books in such cases have sold for > £600.00) - the books in question are not identified, and as such (this being a sealed copy) you could well be the owner of such a copy. (Please note, it is not guaranteed that this copy contains such a drawing, as the book remains sealed in its original slipcased and shrinkwrap).